I just came across this Marc Jacobs Autumn/Winter 2013-14 collection (Elle.com) and vaguely recognised something familiar about the models’ hairstyle. Then I realised that yes this voluminous hairstyle, was actually my own hairstyle (well maybe a slightly more exaggerated version)! 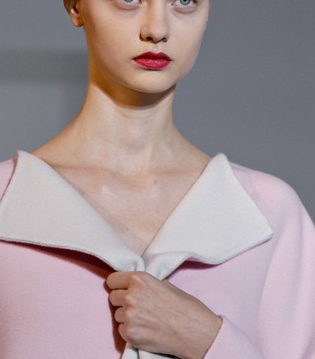 This concept slightly excited me because I have a very “love hate” relationship with my hair and here it is featured in a designer’s catwalk show! You will have seen my hair in some of my posts but until you meet me you won’t be able to witness the extent of its craziness! I have brown, extremely thick, curly hair which is often frizzy and is a nightmare to tame. However, after seeing this catwalk and them embracing my hairstyle and even Cara Delevingne rocking it, maybe I should learn to embrace my hair somewhat more – Enjoy! 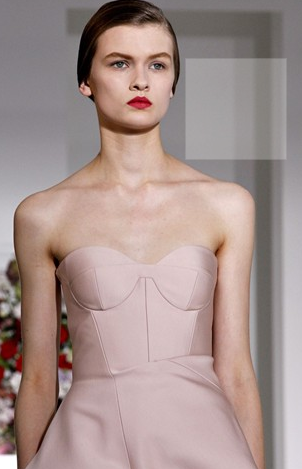 I adore this Moschino outfit JUST IN from the Milan catwalk!! The monochrome colour scheme is extremely classy and the outfit gives off many 1960’s influences- with the metallics, monochrome, stripes and distinctive headwear!! This outfit looks so well put together and really looks like you’ve put a lot of intensive thought into planning it, so well done Moschino!! !- Enjoy!! This post is of 3 catwalk pieces which all fit into the trend BLUE!! 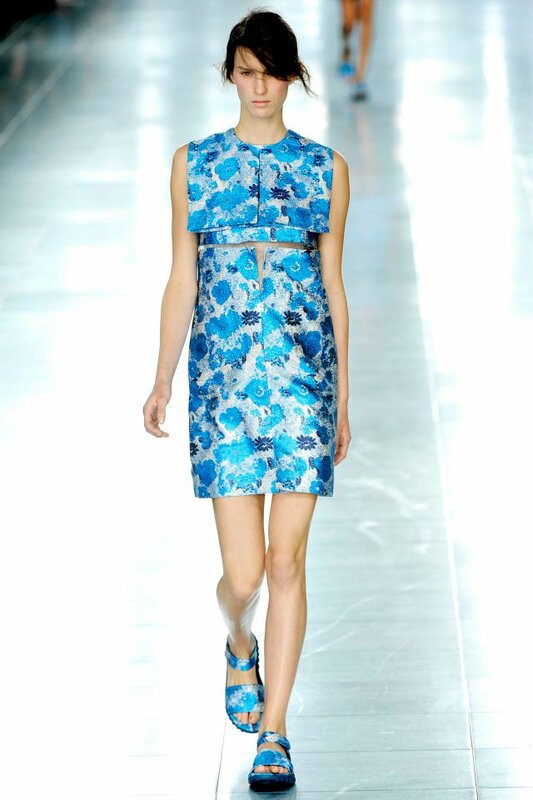 The first picture is by Christopher Kane and is this beautiful bright blue floral dress with matching sandals. The second picture is this very striking deep navy blue YSL dress and I adore the ruffle details down the side!! The last picture Stella McCartney shift royal blue dress which is boxy and has long sleeves!! Hope you like!! 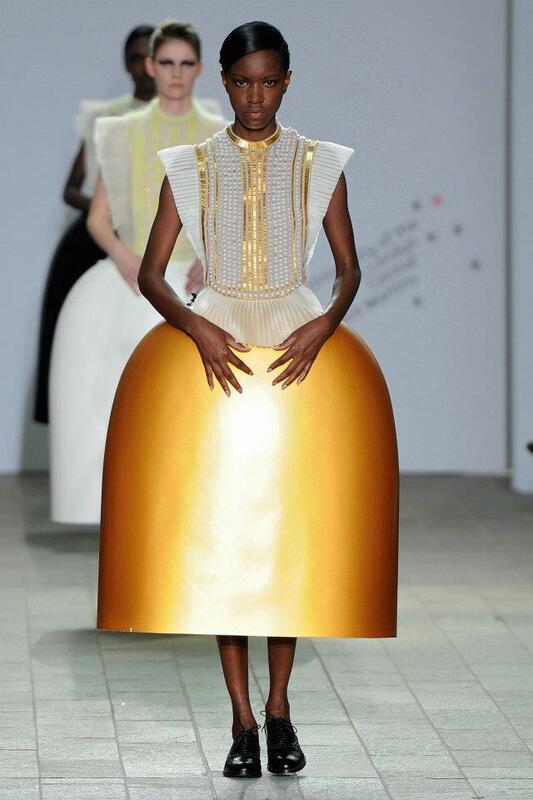 These pictures are taken from the Central Saint Martins BA Show from the British Vogue Facebook page. Each one is individually sensational and such a striking and eye-catching piece!! The first is by a designer called Serena Gili and she clearly knows what she’s doing as this range is stunning with these structured skirts which I have never seen anything like before. 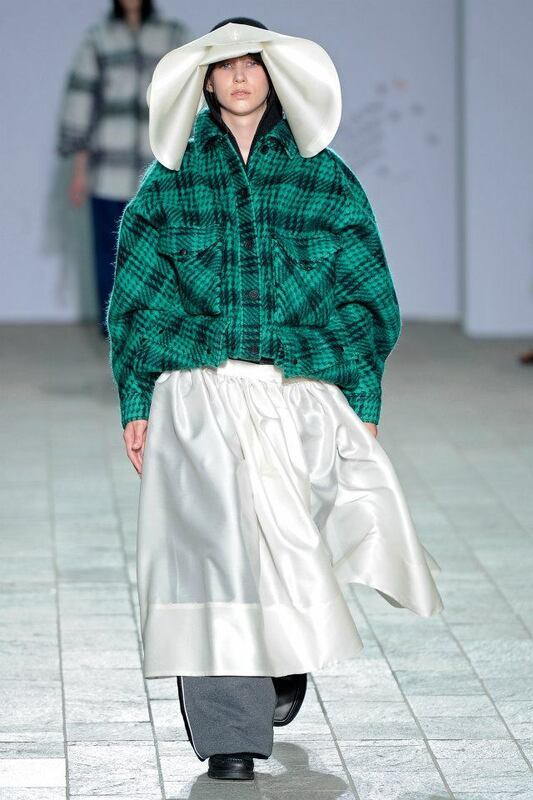 The next is by Erin Hawkes and is this extremely oversized look with checked green jacket, oversized pleat white skirt and huge head bow. This outfit is very fashionable but possibly a tad controversial (shown by comments on Facebook page)!! The third look is by Alan Lee which I absolutely adore!! 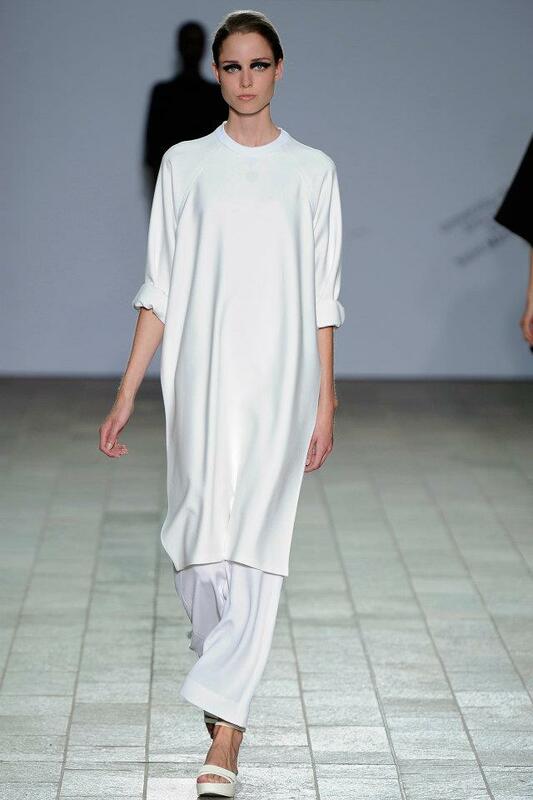 Its so minimalistic with just a cream midi dress and white trousers. 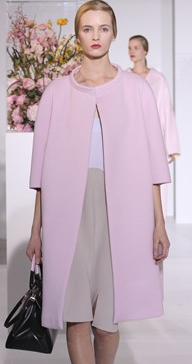 I love how simple it is but sooo classy and glamorous definitely my favourite out of the 3!! Hope you like! !